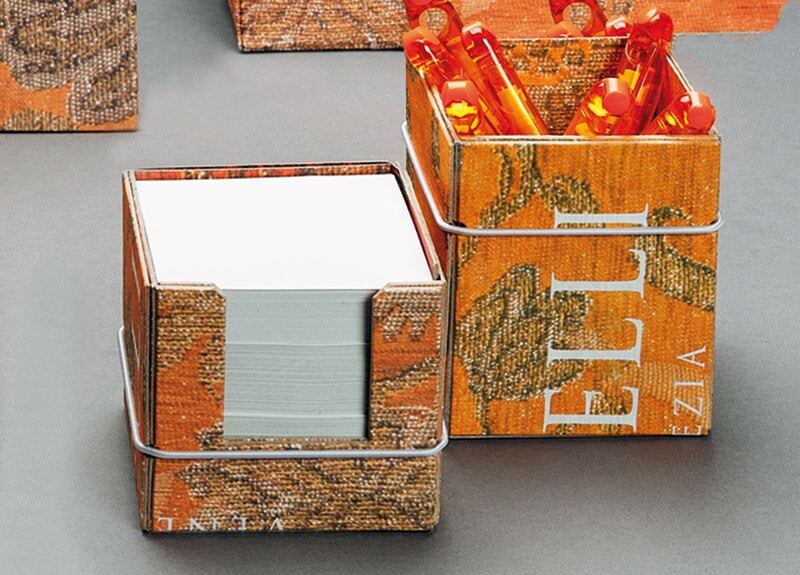 Ricarta (Repaper) is a line of products designed by Alisea using 100% recycled paper. 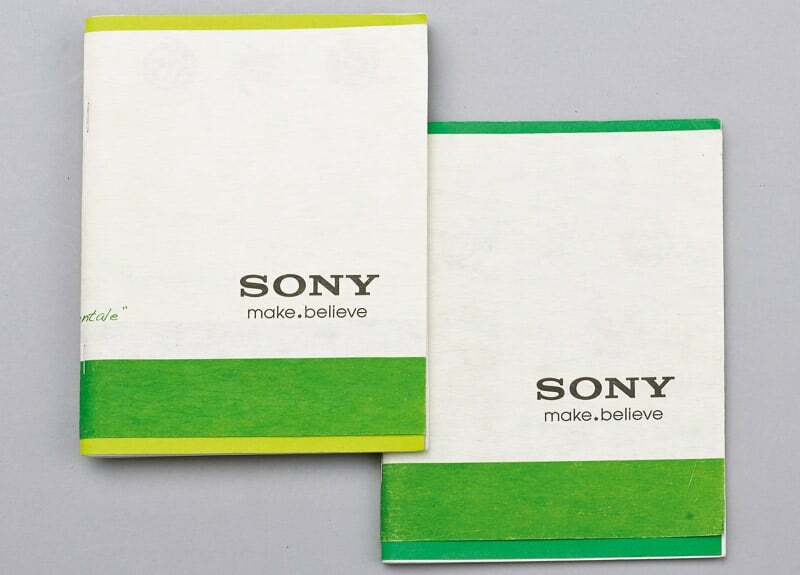 On request, the advanced design can be customized with different types of paper from a sustainable supply chain, such as the seaweed paper, crush paper or apple paper. 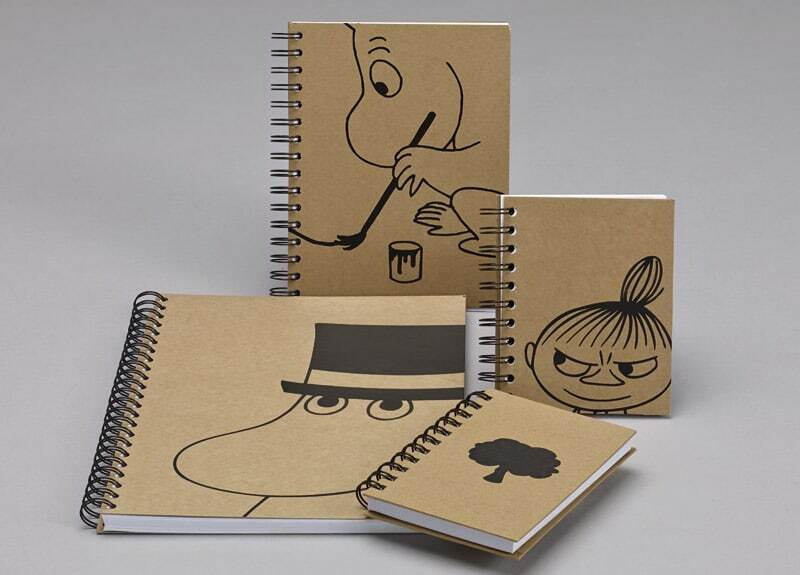 No trees are felled to create the paper used to produce notebooks, notepads, folders and packaging. 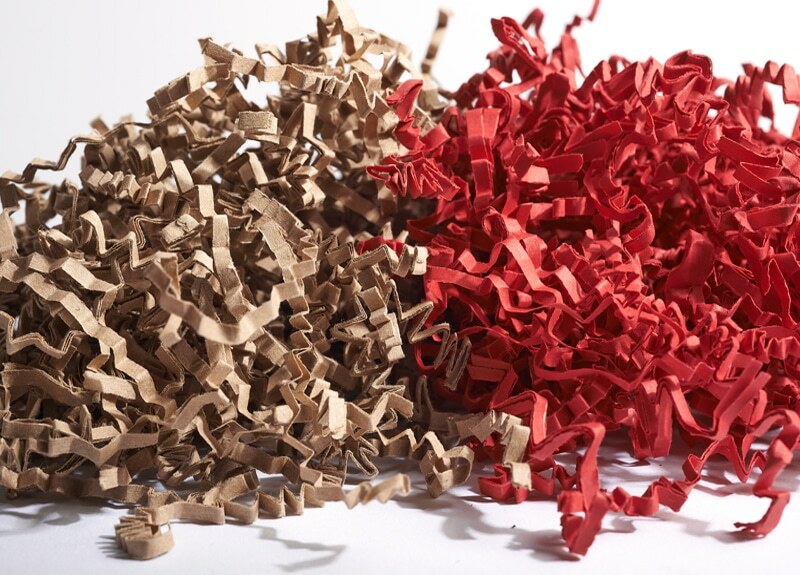 All the paper comes from specially selected pulp, from recycle depots, free from chlorine or derivatives, and no wood is used as a raw material. Producing paper from recycled pulp also minimizes the use of energy, water and harmful chemicals. Care for the sea to save the trees. Every summer the Venice lagoon is filled with seaweed. And every summer it is harvested and mixed with FSC-CW fibers to create a unique eco-friendly paper: Shiro Alga Carta®. This paper provides an ingenious and innovative solution to protecting the fragile ecosystem of the lagoon. Like a living thing, the texture and coloring of this paper varies depending on the time and area of the harvest and it is the only paper that becomes lighter naturally over time because of its chlorophyll content. Shiro Alga Carta® is pH neutral, “acid free”. The Apple Paper is created by using the non-recyclable waste produce from the production of fruit juices and mixing the “apple cellulose” with the traditional cellulose. Every care is taken to protect the environment during its production. It is environmentally friendly, 100% recyclable, made from sustainable raw materials and completely free of chlorine and heavy metals. 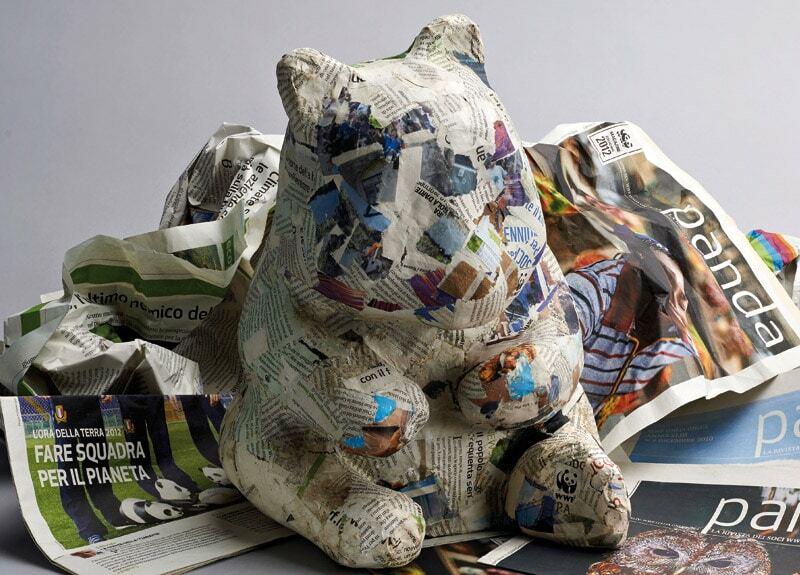 The WWF papier-mâché pandas were made by recycling old WWF Magazines. The adhesive was produced using flour and water and the colors are water-based. The mold was made from jute and water. 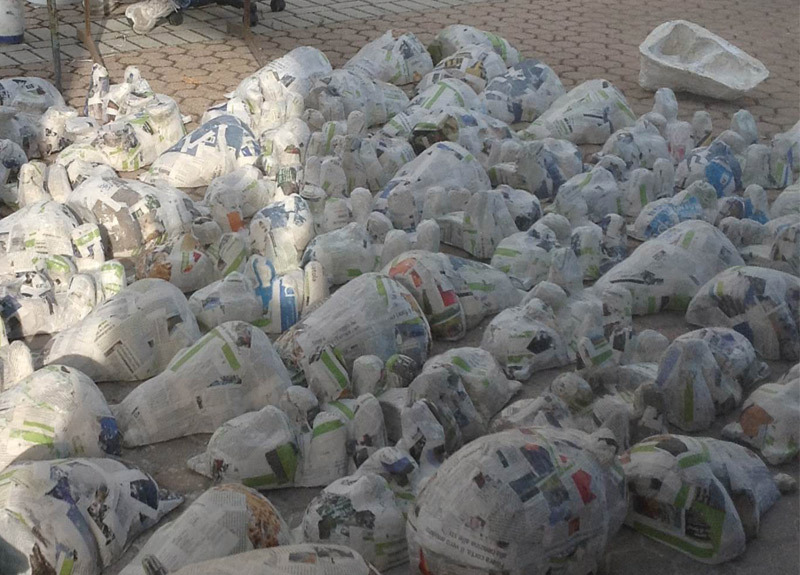 The whole production process was completed by hand by a social cooperative whose primary purpose is human enrichment and the social integration of people with disabilities by promoting papier-mâché and the revival of local traditions. There are only 1,600 pandas in the world. 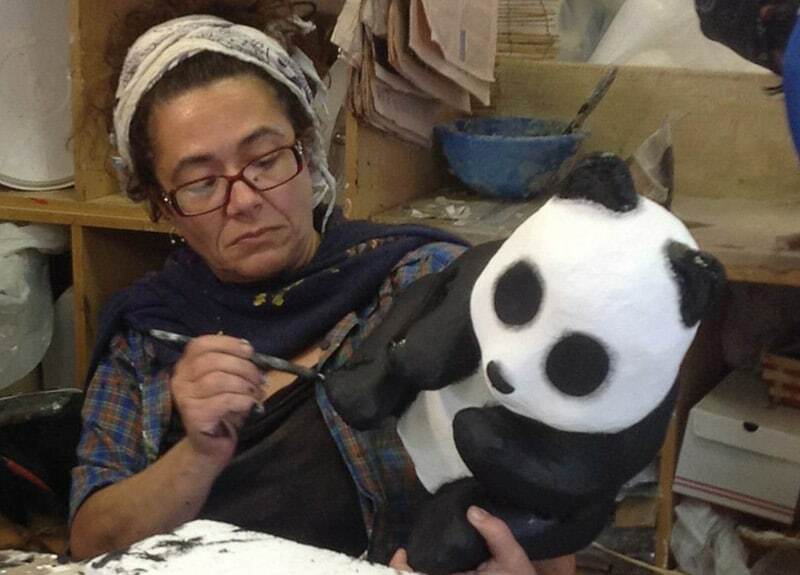 There are only 1,600 limited edition pandas made by Alisea, each of which has a numbered certificate of authenticity. The WWF Panda before being colored and adding the WWF logo. The sheets of old WWF magazines were mixed with a glue made of flour and water before being shredded into small pieces, pressed by hand into plaster molds, and finally allowed to dry. 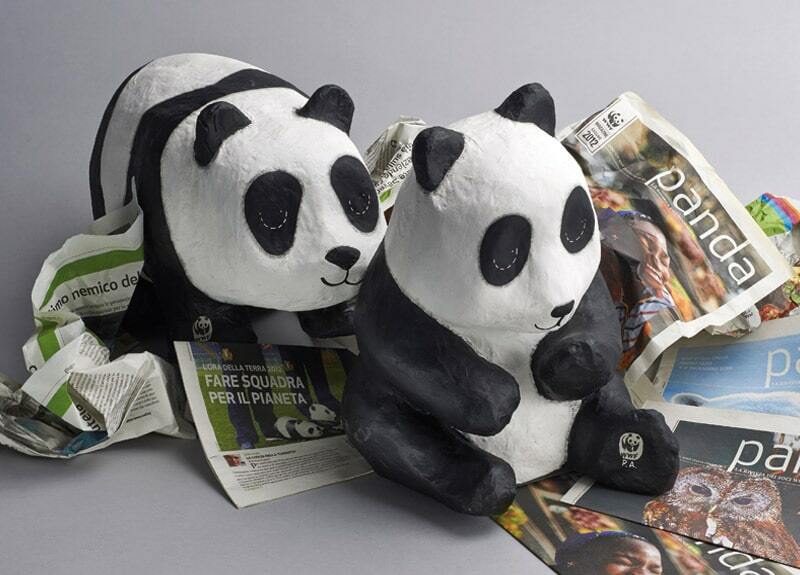 The WWF papier-mâché Pandas were made by using old “Pandagift” magazines. 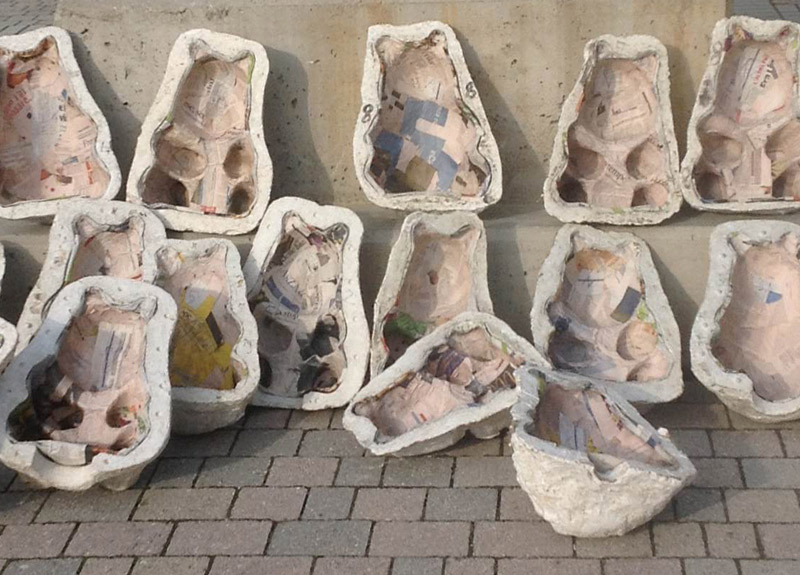 The almost-dry papier-mâché shapes of the WWF Panda were removed from the molds and were blow-dried before being assembled. 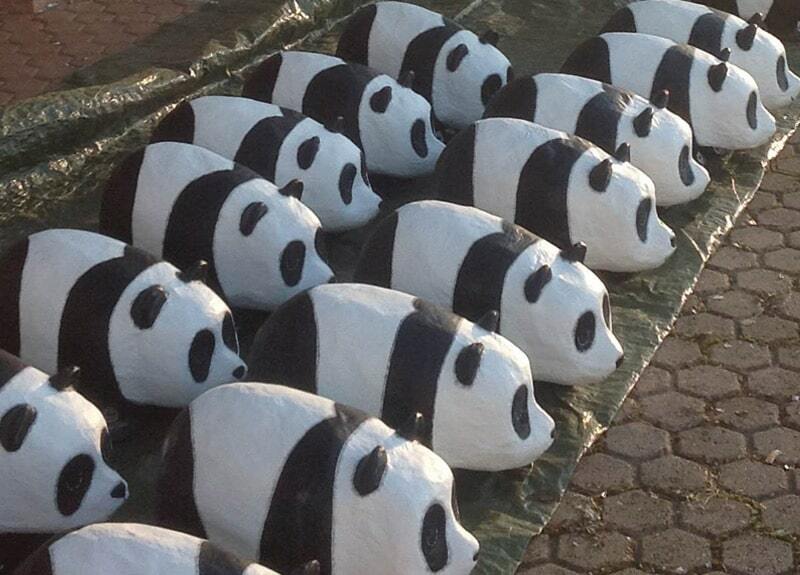 The Pandas were entirely colored by hand using acrylic paint. 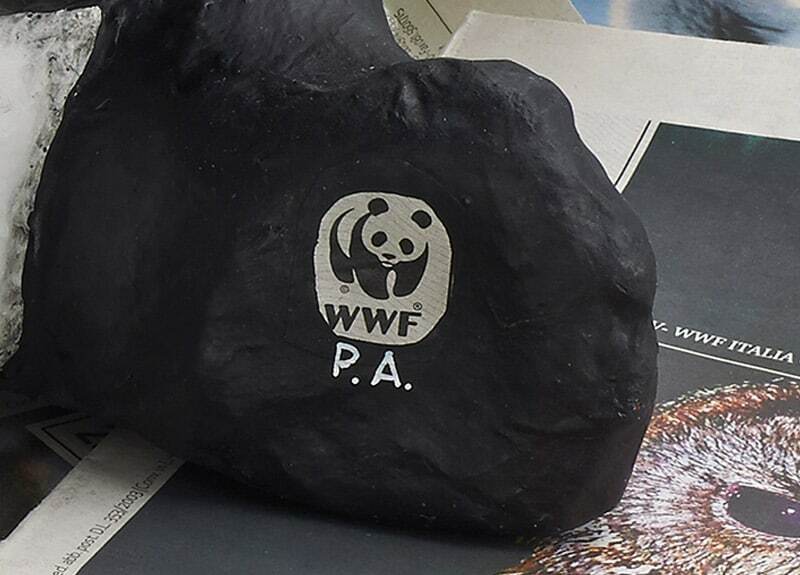 Once completed, the WWF pandas were numbered, certified and packaged. Innovative integrated writing system, which uses an original solution for the custody of the pen, a solution subject to patent filing (Patent Pending). The materials with which we wanted to make ONE are entirely derived from the recovery and recycling of post-consumer paper, preventing the cutting down of trees. ONE always lives with her pen, also entirely Manufactured in Italy. Both the cover and the pen are customizable. For ONE, a closing system is available upon request, using two O-rings available in 10 colors. The O-rings originates from hydraulic seals are made of natural rubber and colored with ingredients of vegetable or mineral origin in Italy: for the first time they are used in an alternative way, thus becoming multi-purpose objects. 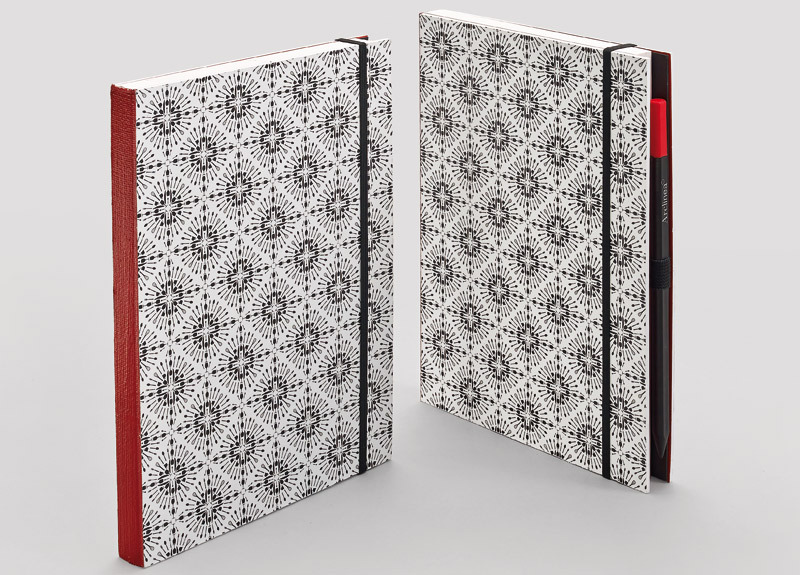 Custom-made in coloured screen printing on the entire surface, cover in black Leatherlike paper. Cordenons Paper Mill (FSC), Heavy Metal Absence, Elementary Chlorine Free, Recycable. Leatherlike is a card that recalls the characteristics of real leather; is inspired by the fashion industry. On its surface the typical designs of the leather are easily recognizable: they have a particular style and a unique touch. The inside sheets in 100% recycled paper. A detail of the insertion of the pen in a “hiding” function, specifically created for an original and unprecedented style of writing, Patent Pending. 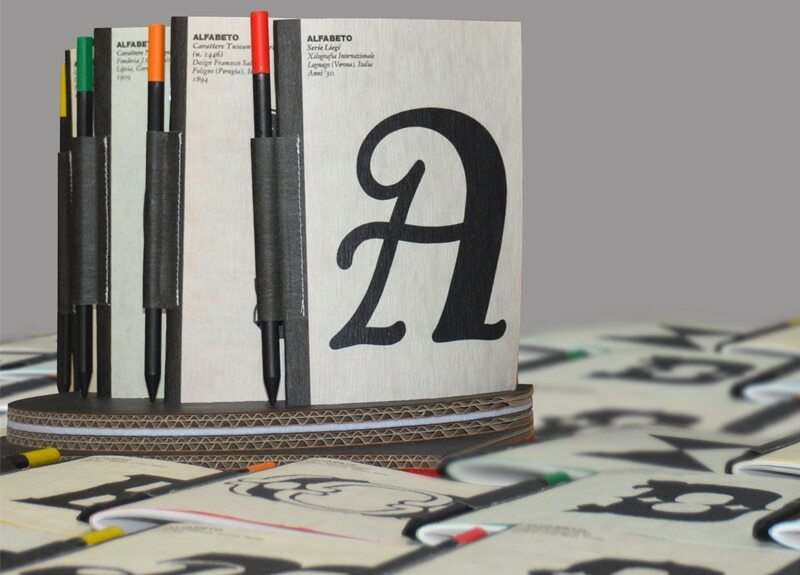 The pen isavailable in 8 different colors, customizable, manufactured in Italy. The Post-Processing recycled plastic pen is available in 3 colors: White, Black, Gray and pastel colors. The Glu’ notebooks will revolutionize how you use a notebook: you will no longer need to flatten the pages with your hands. 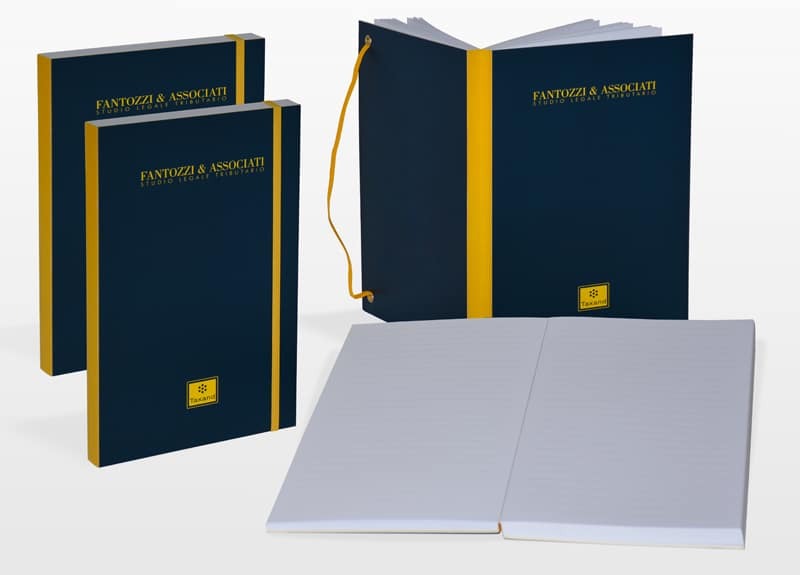 This new type of binding reduces the curvature of the pages and allows you to read and write at 180°. For the first time, you can see either one cover at a time or open out the book and see the double spread of the front and back covers together. 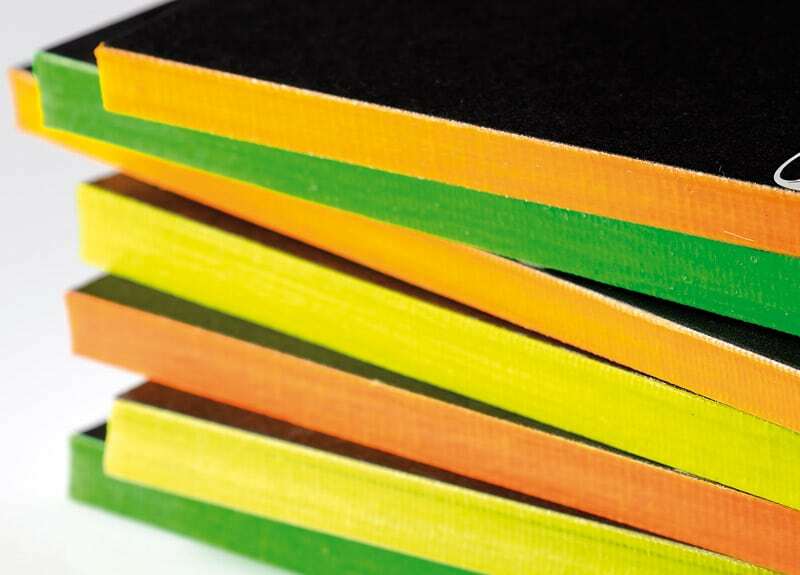 The Glu’ notebooks are made using a biodegradable glue enriched with vegetable elastin and stained with non-toxic tempera paint in the colors requested by the customer. 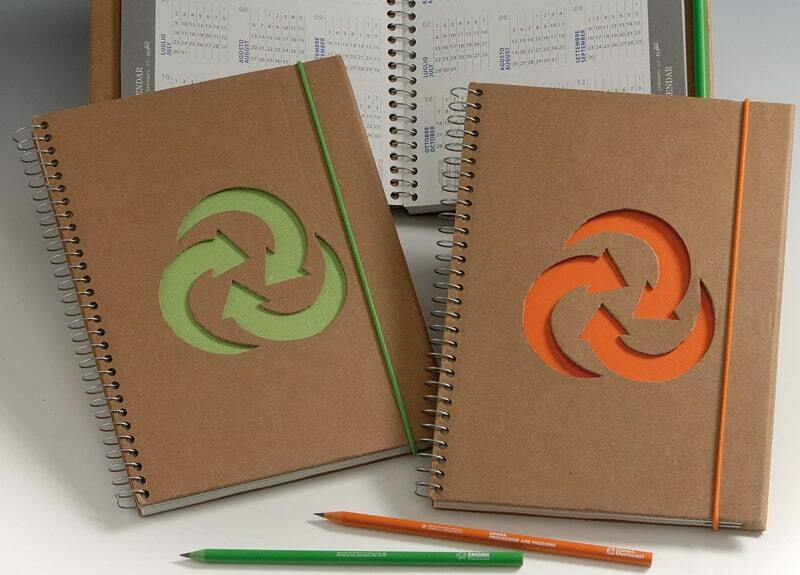 2014 planner made of recycled paper with Glu’ binding. The photos, pictures and texts can be seen much more clearly. 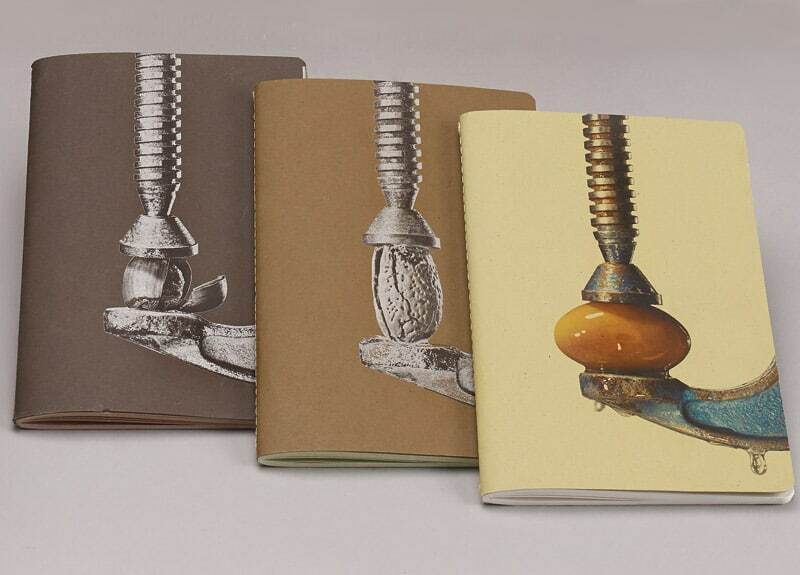 Glu’ Notebook, elastic fastener, internal pencil holder. 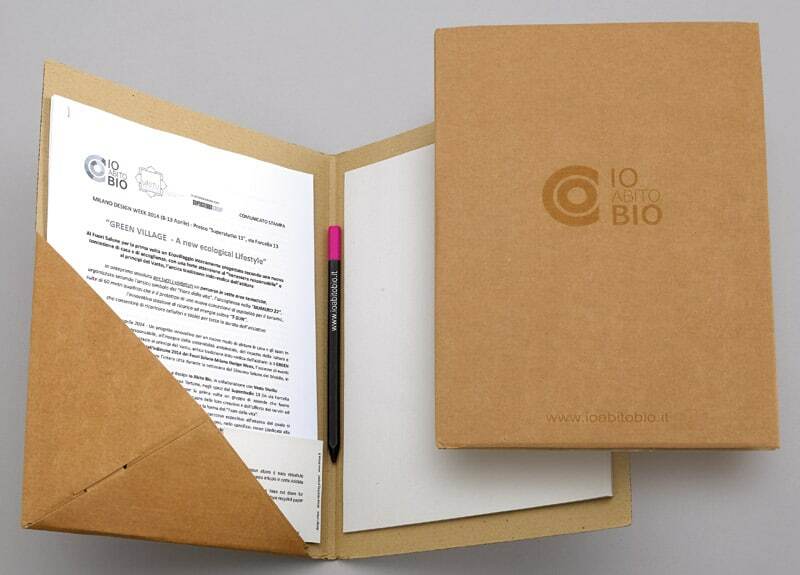 The back of the Glu’ notebooks is made using a biodegradable glue. The customer can choose the Pantone color. 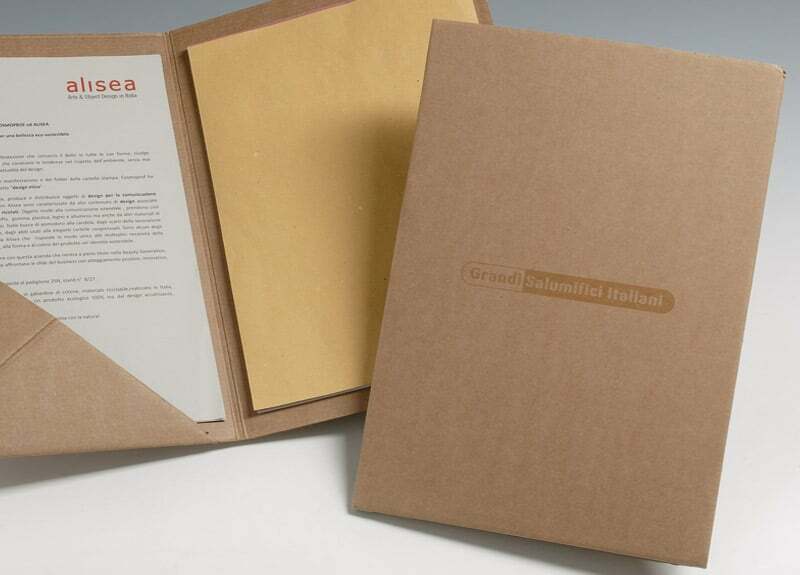 Glù notebook is chosen by Studio Legale Fantozzi & Associati with two colours offset print of the company’s brand. 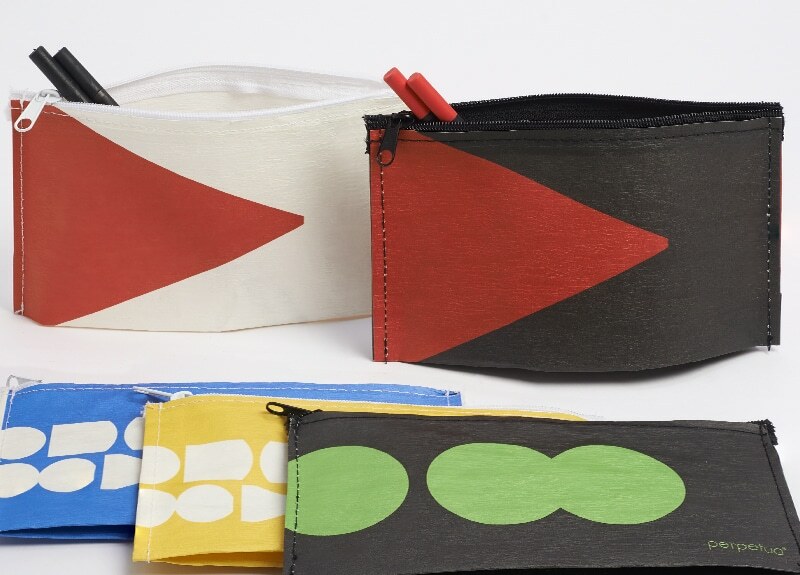 It is equipped with a coloured elastic fastener that matches with the coulor of the back of the notebook. Detail of the back of the notebook made with a biodegradable glue that reduces by 30% the use of elastine compared to other glues. 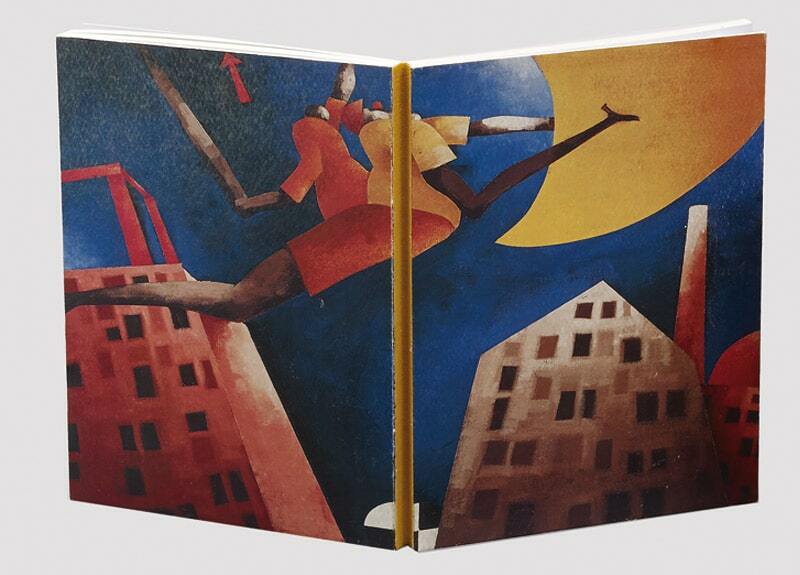 The notebook cover is a print of “The Dance of the Philosophers” by Emilio Tadini. This prototype was selected by the Museum as the winner of the “Nutrire l’arte” (Feeding the Art) competition, dedicated to Museum merchandising. 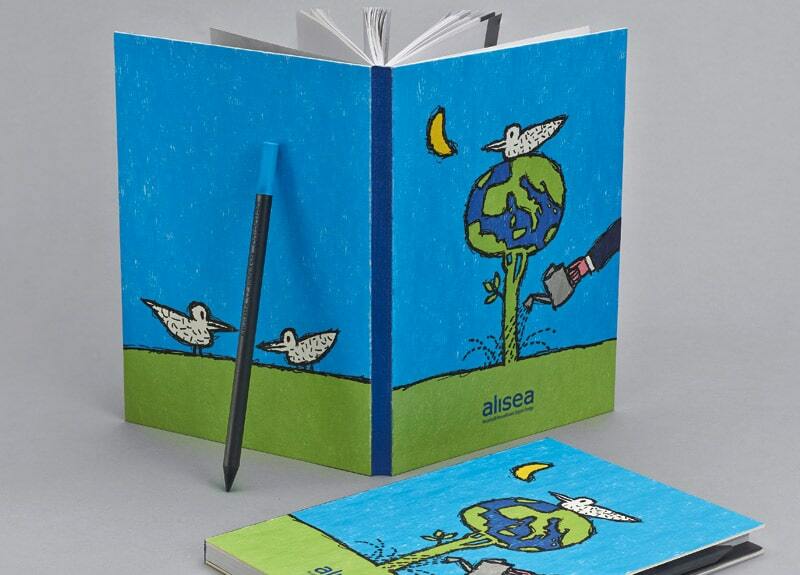 The Alisea planner is a gift that we create every year for our clients. The cover art was created exclusively by Franco Chiani, graphic designer. As always, the image is available to all Alisea customers should they wish to use it. 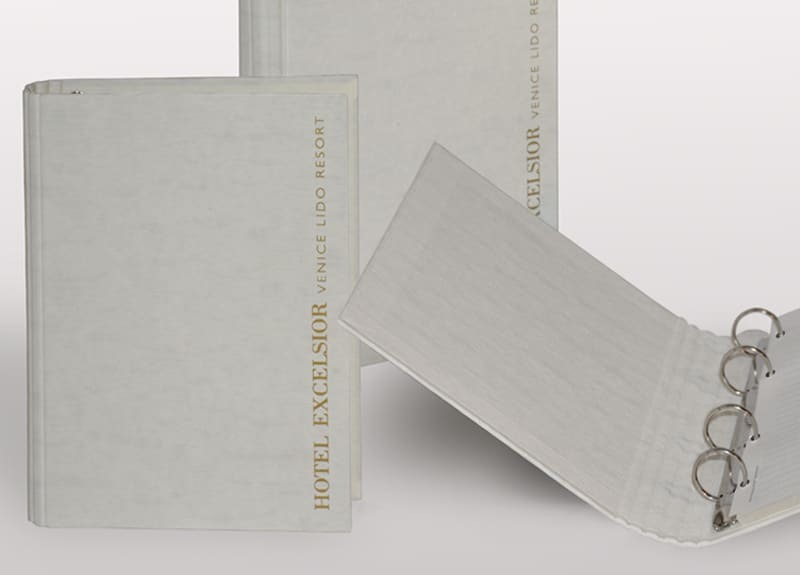 A unique type of paper that combines an elegant embossed finish with incredible wear and moisture resistance. The 100% cellulose paper has FSC-CW certification as it comes from sustainable farming and is 100% recyclable. This paper was traditionally used to produce industrial bags that had to be resistant to high humidity, wear, tear and abrasion. The Binders are made using Ecophilosophy paper. The locking inside, can be customized depending on the customer’ storage needs. The Ecophilosophy Binders are always tailored to meet the customer’s needs. The reproduction of the opera “Mona Lisa with the keys” 1930, by Fernand Leger, becomes the cover of the room directory for the hotel in Milan. For the new re-styling of the Hotel degli Arcimboldi in Milan, the cover of the room directory in Ecophilosophy paper recalls the painting’s design within the hotel itself. 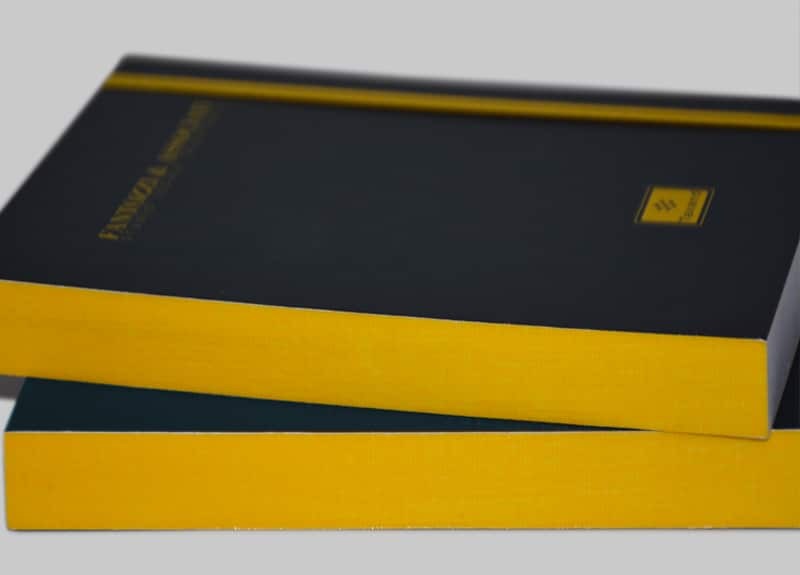 The customization in gold silk-screen of the Ecophilosophy paper cover, recalls the color of the logo of the famous Venetian hotel. 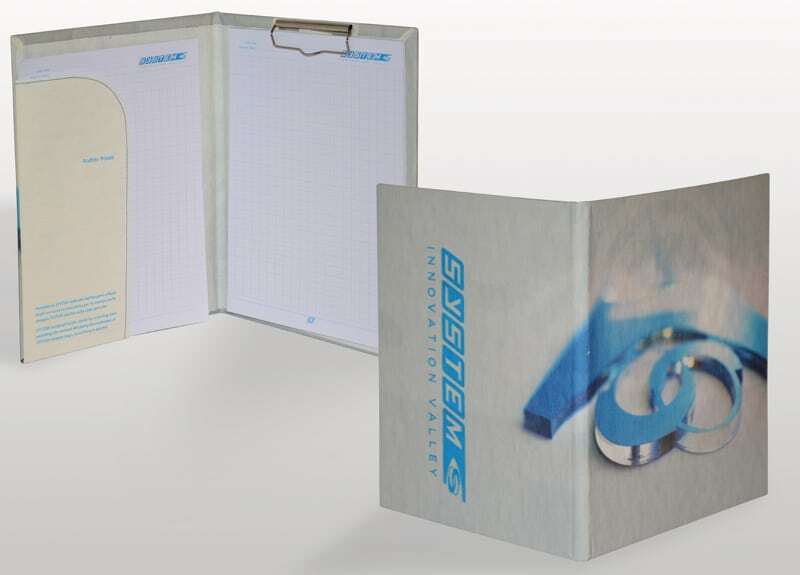 System holder in A4 format with block clamp in aluminum, comes with a block in clear recycled paper and an inside pocket with nominal customization. 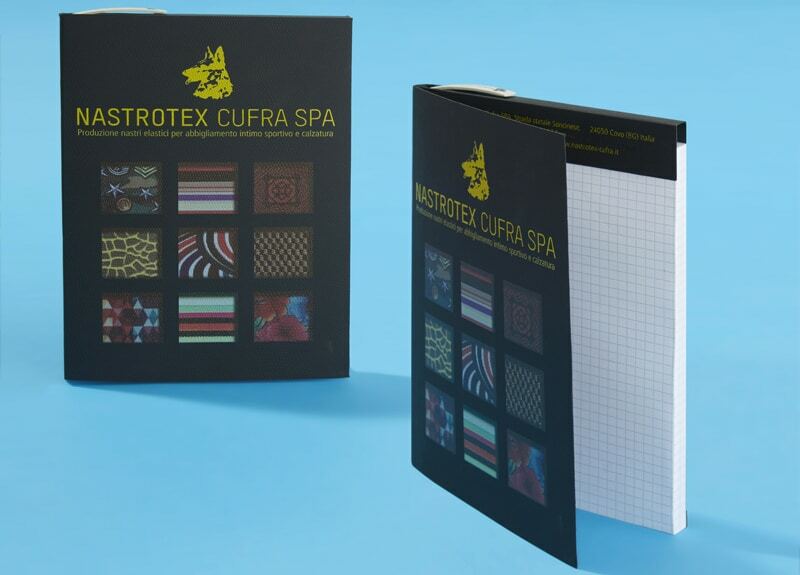 Personalized cover with offset printing of the company logo and graphics. 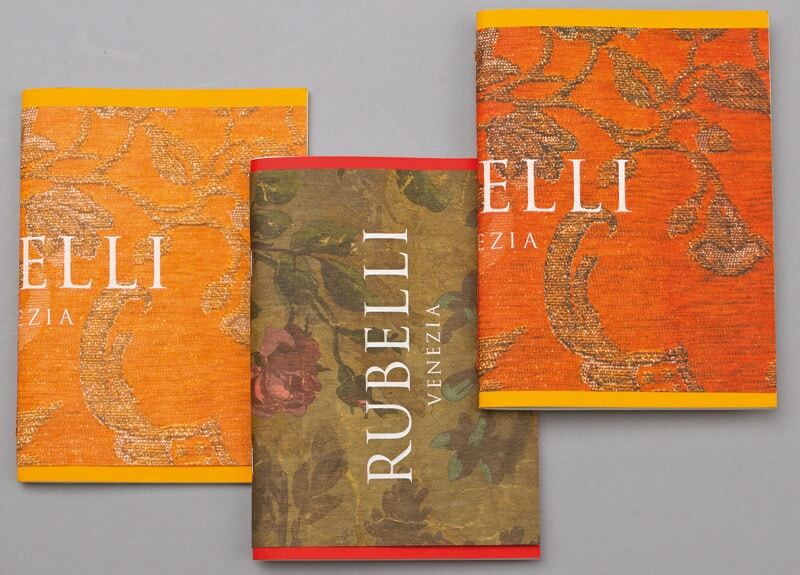 The reproduction of the Rubelli’s texture becames the cover of its staple-bound Ecophilosophy notebooks. 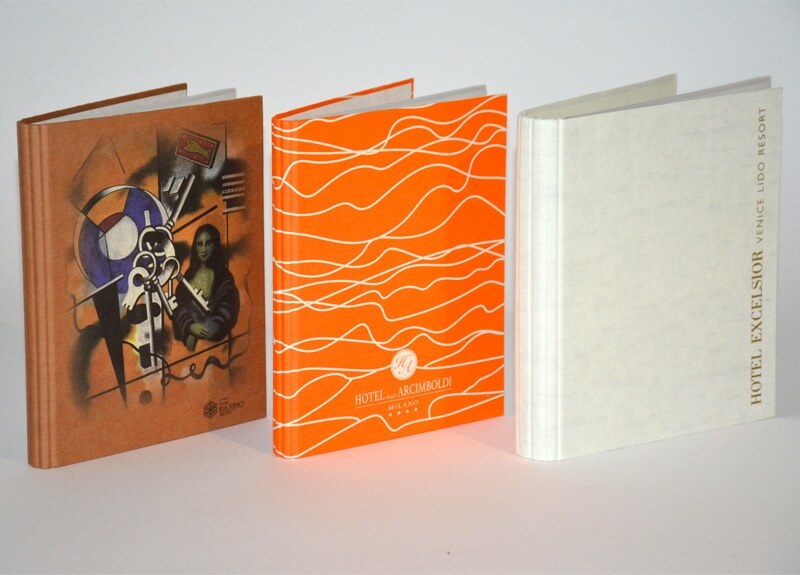 Staple-bound notebooks made from Ecophilosophy paper. 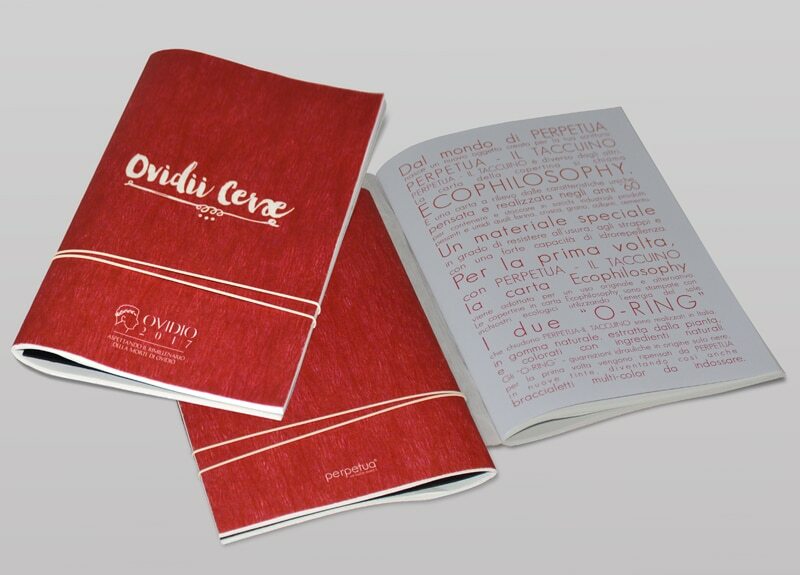 Stape-bound Ecophilosophy notebook with personalization “Ovidio 2017” . 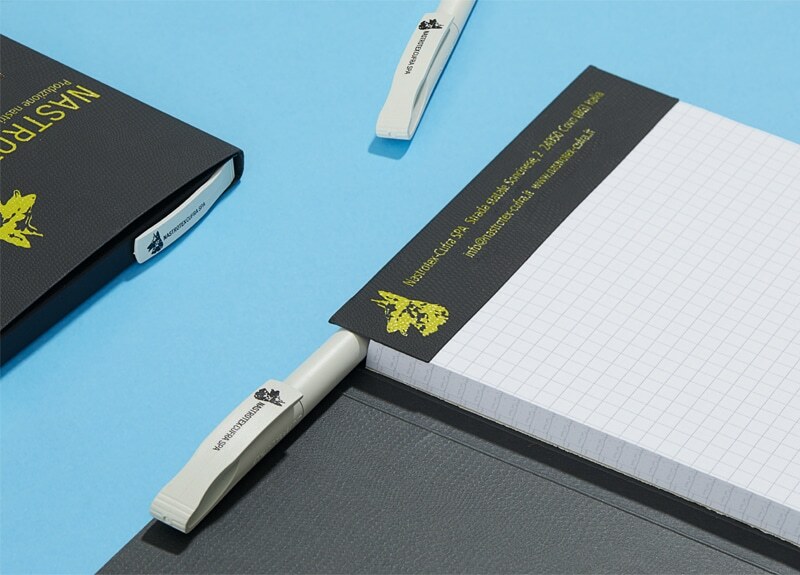 The Spillo notebooks in Ecophisolophy paper are always customized according to customer needs and can be combined with various writing instruments. 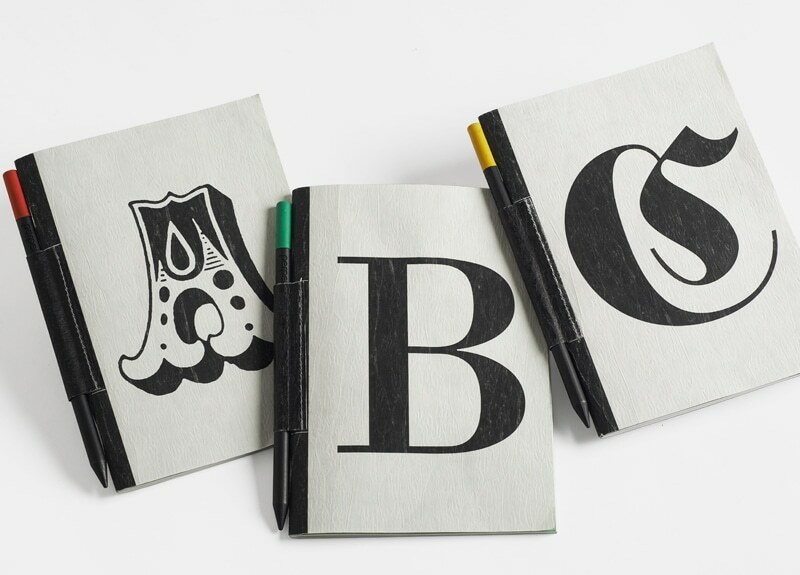 Alphabet – The Notebook is what happens when 2 different companies sharing the same love of culture combine. Tipoteca Italiana is an innovative museum concept that aims to protect the printing tradition. 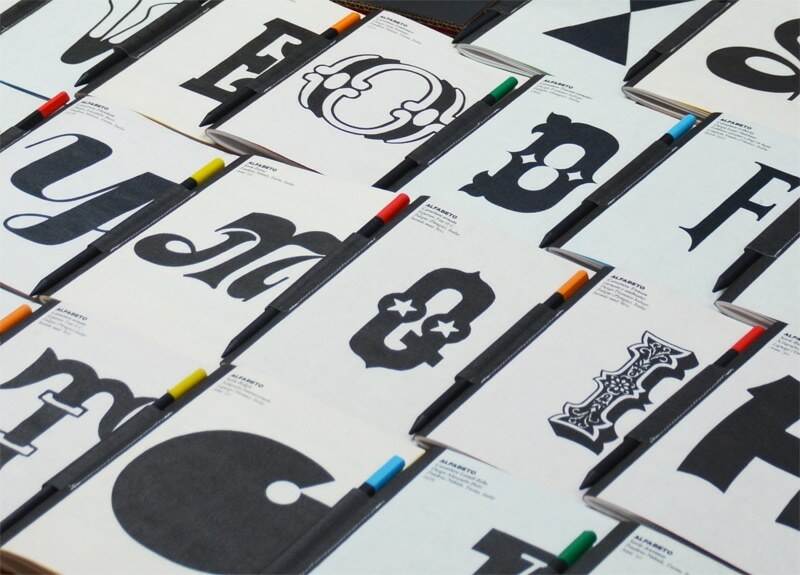 A collection of wooden typefaces, matrices, and punches is on display in a one-of-a-kind museum. Perpetua la matita, a different pencil from all the others, because it is made of graphite, left over from industrial processes. It does not break if dropped, it can be sharpened, and it writes even when blunt. Designed in Italy. It is a product and process patent. Alphabet – The Notebook is the notebook resulting from this unique combination. 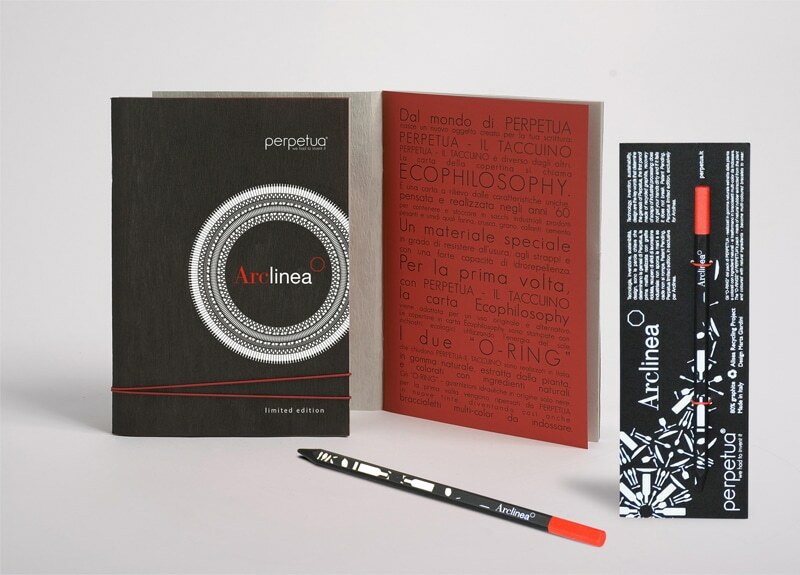 It is made with Ecophilosophy paper, with original letters printed by ancient typographic machines, and Perpetua completes a product that is a unique blend of tradition and innovation. 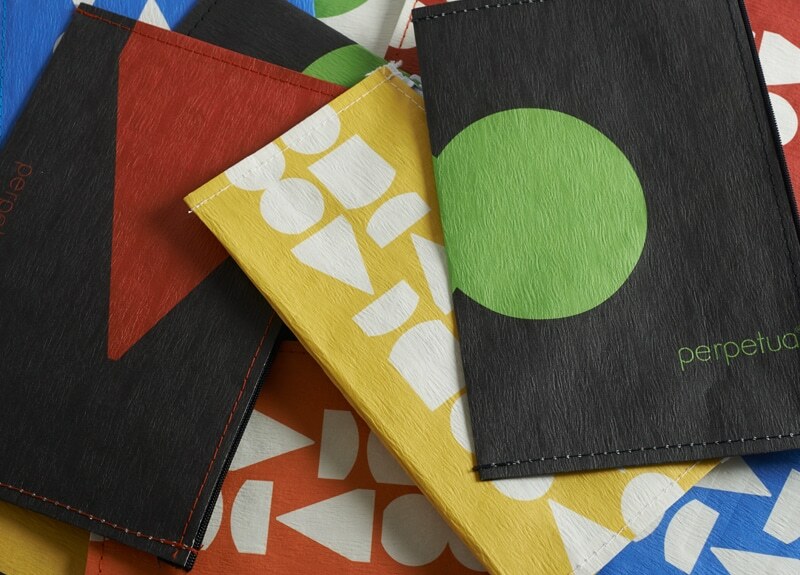 Alphabet – The Notebook with special exhibitor for the world of the retail. Overview of the covers with the prints of the original letters printed by ancient typographic machines. This paper made from 100% virgin unbleached fibers is used to make bags for commercial use and is the best solution for strong sustainable packaging. 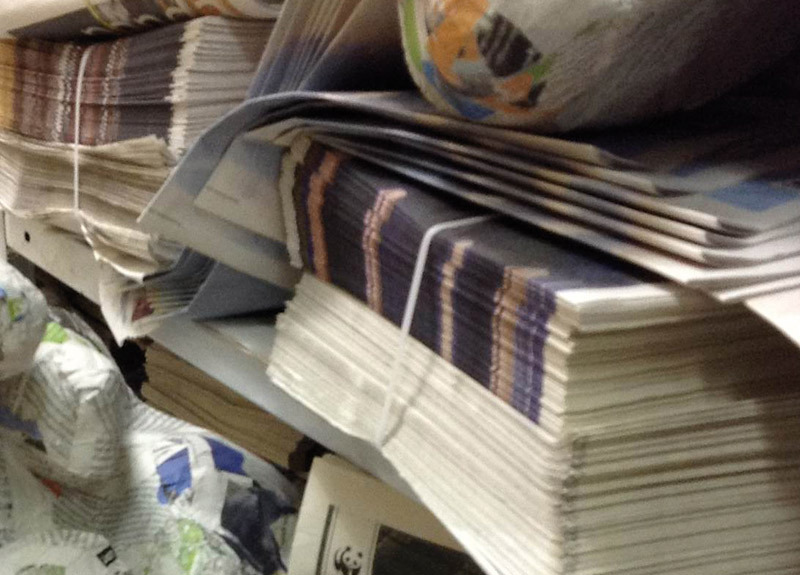 The paper is FSC-CW source certified. 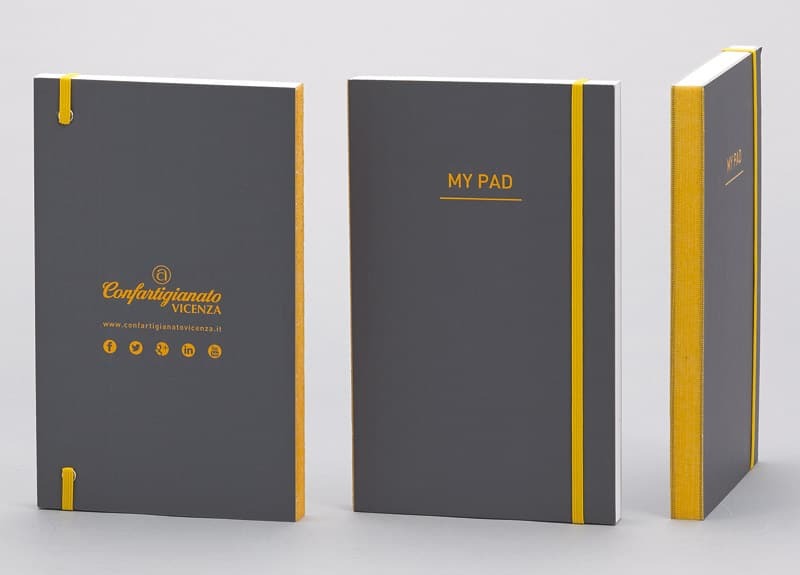 The inside of the notebooks is made using 100% recycled paper. Possibility of custumization of the internal pages. 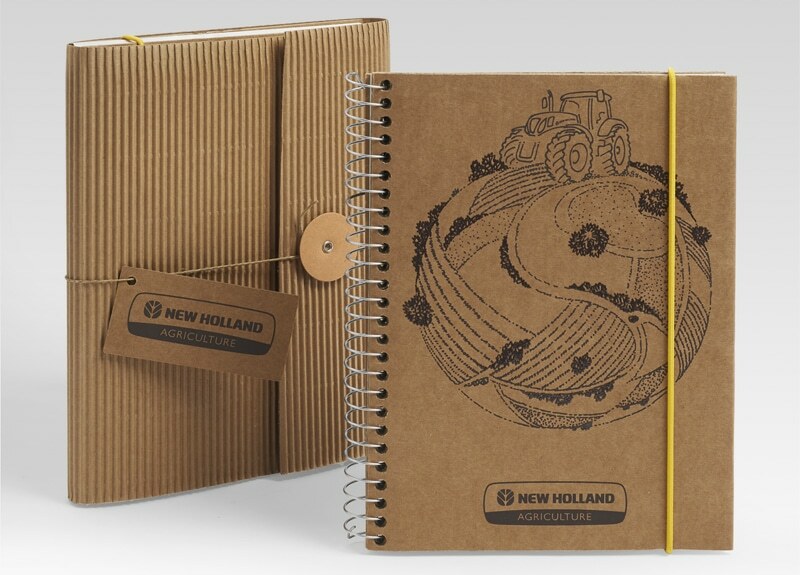 No trees been cut down to produce the Notes for New Holland Agriculture made by ALISEA, the inner sheet and the cover are made of paper and recycled cardboard, the spiral is made of recycled aluminum and any type of glue are used. Recycle symbol cut into the cover. Elastic pencil holder inside the spiral bound notebook. 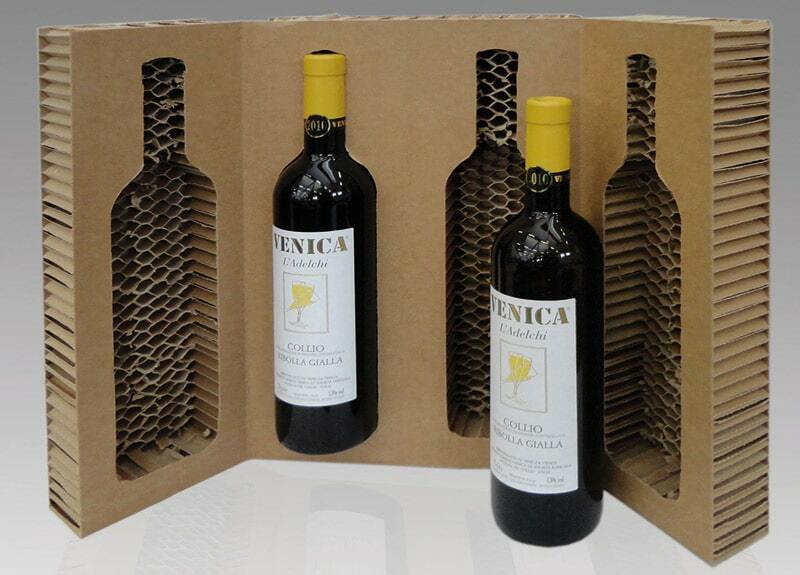 Corrugated cardboard is used mainly for packaging. 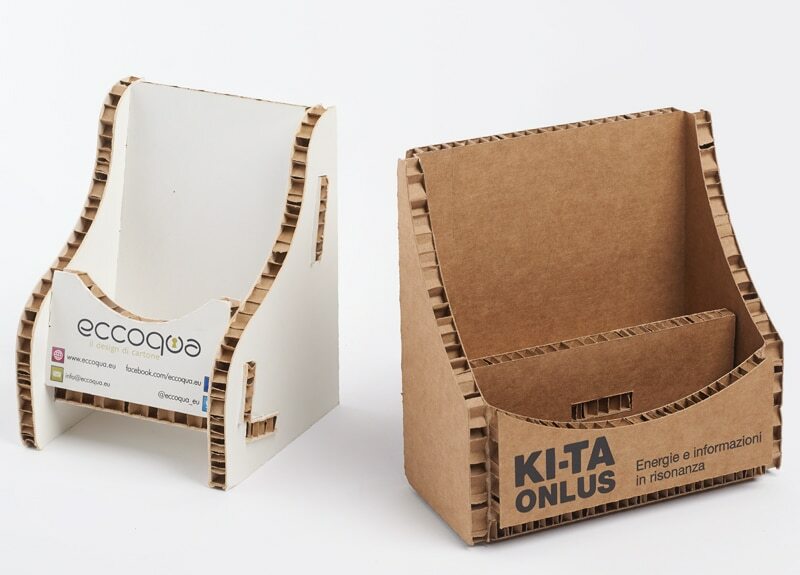 In its simplest form, it consists of two flat paper surfaces that enclose corrugated paper and that are bound to each other using natural glues. 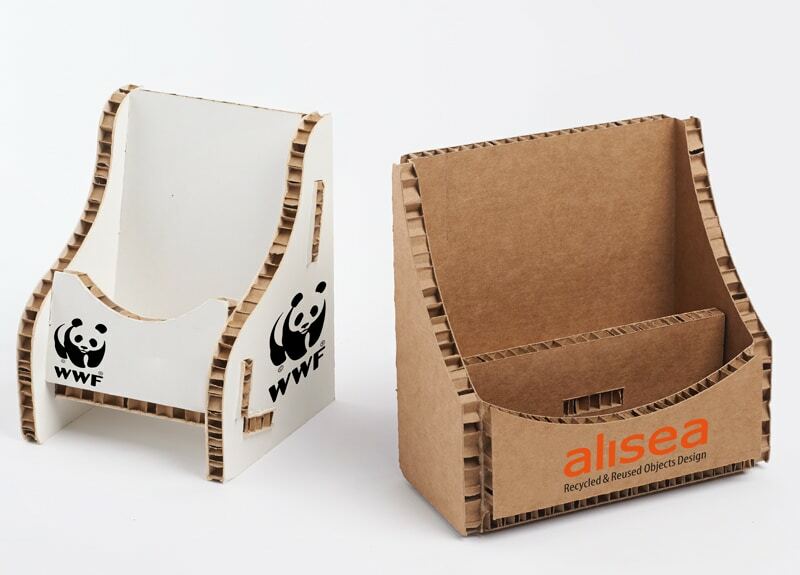 The combination of the covers and the internal wave makes the 100% recyclable and biodegradable cardboard rigid and strong. Inside the folder there is a convenient document pocket. 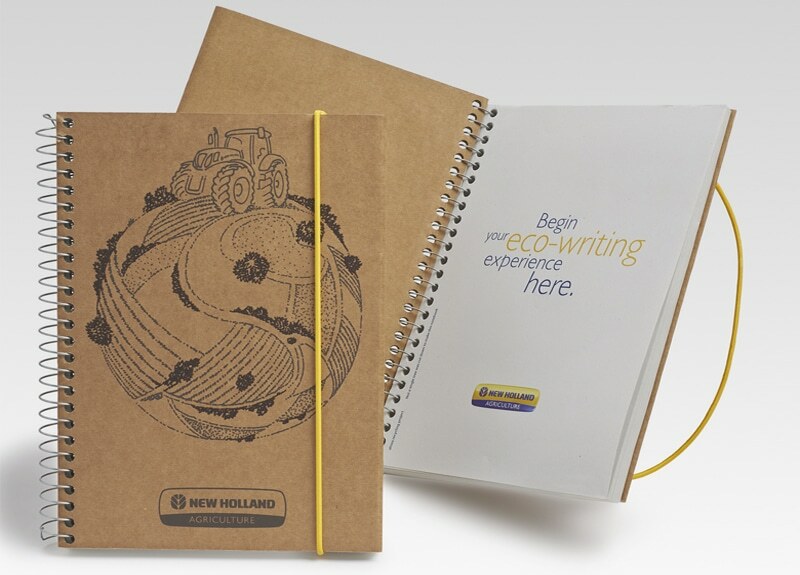 It comes with a 15-page notepad made from recycled paper. Size 23×33 cm (9.06×12.99 in). Folder with UV gloss silk screen printing. This paper is made from the by-products of food processing, as a partial replacement for tree cellulose. Citrus fruit, kiwi, corn, coffee, olive, hazelnut and almond waste food residues, commonly used as supplements for livestock, fuels for producing energy or disposed of in landfills, are reused as raw materials in an alternative and original way. The materials used are visible on the surface of the paper giving it an unusual consistency. 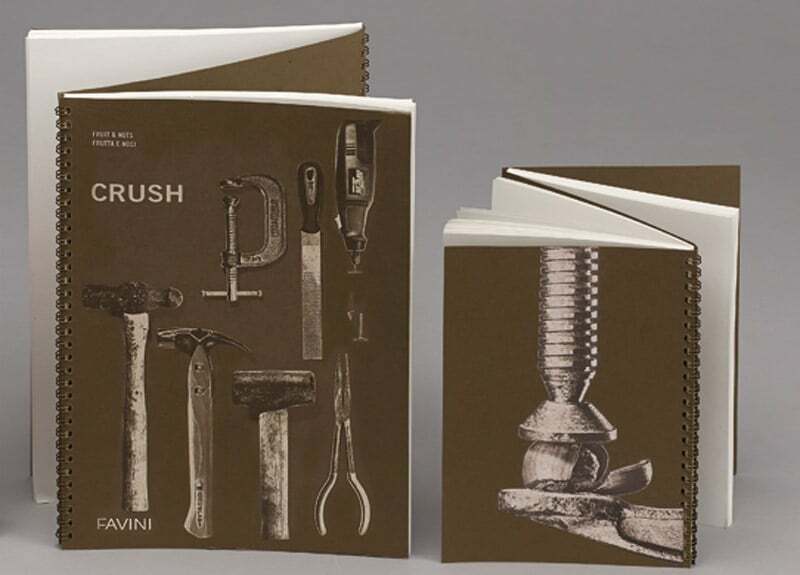 The paper is FSC-CW certified, contains 30% post-consumer recycled materials and is produced by the Favini paper mill with 100% self-produced green energy. The product and the production process is protected by a European patent. 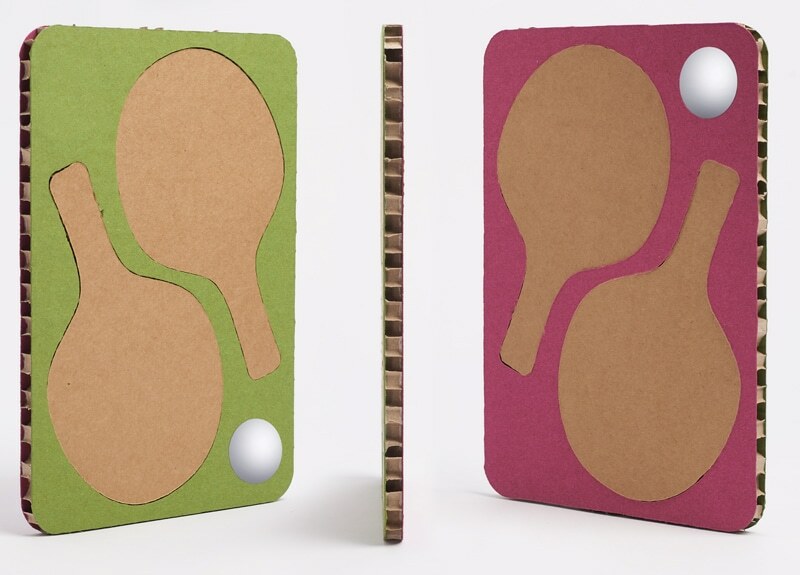 The Double Face notebooks are double and reversible notebooks. They have a double cover and can be used from both sides. 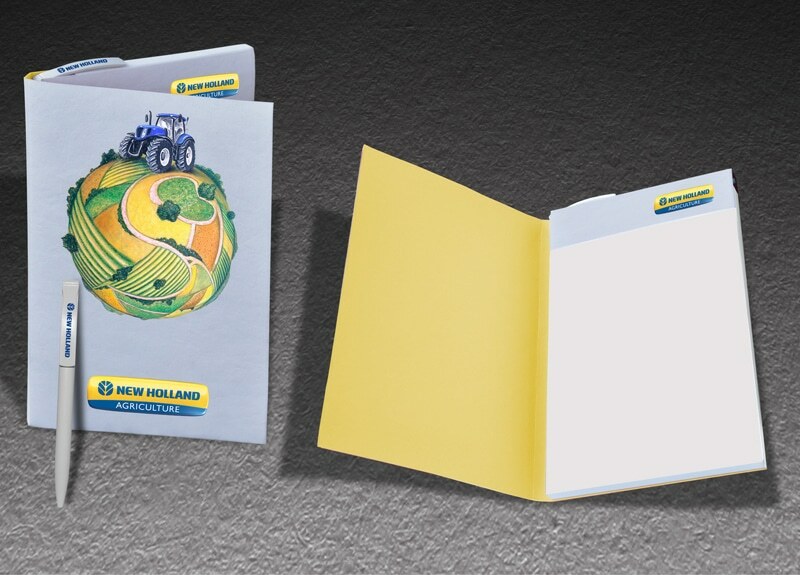 A third inside cover creates a larger area to be used for customized communication. 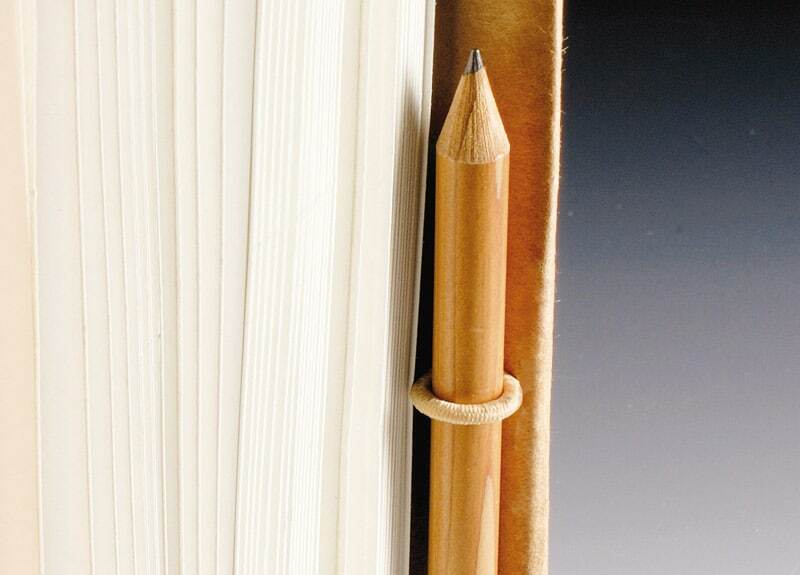 Notebooks made from Crush paper have stitching along the spine (Singer thread). The stitching can be in any color. 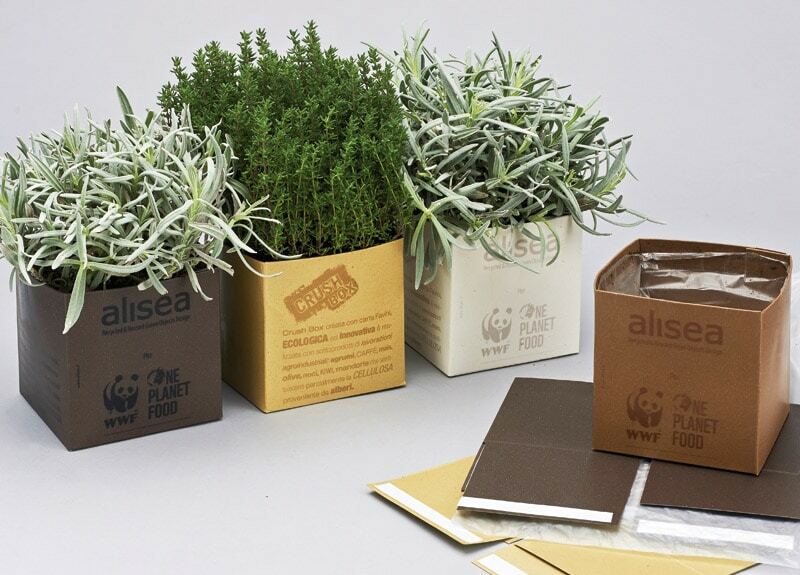 The WWF Crush paper plant pot box is made with food processing by-products. Origami pencil holder. DIY design made by Alisea specifically for Fermoeditore. They are made of old brochures so as to waste nothing. 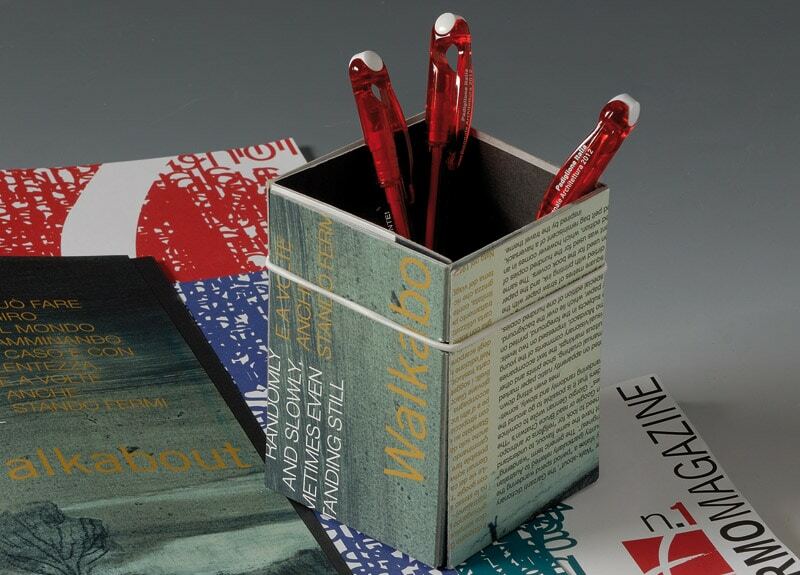 Each pencil holder is different as different pages of the brochure were used to make it. 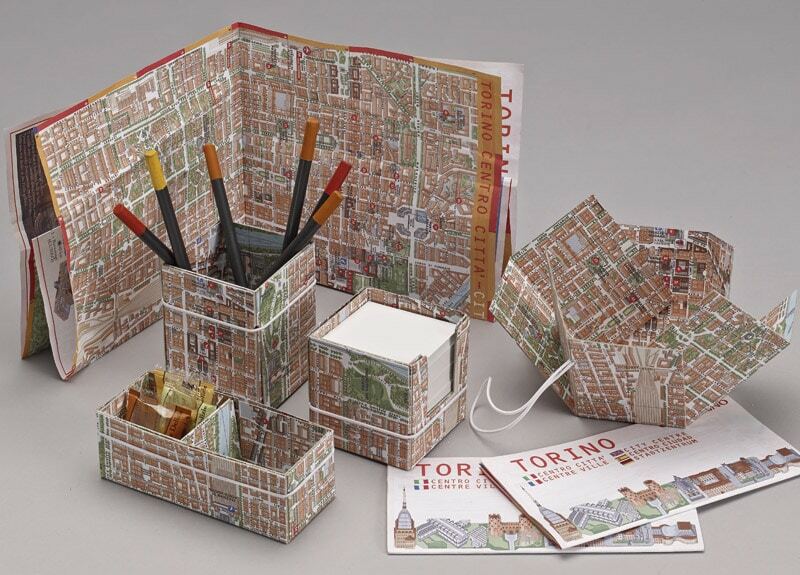 Origami desk accessories including a pencil holder and a memo block and object cube, made from misprinted tourist maps. Pen holder and memo block cube made from leftover sheets from the production of the Rubelli Ecophilosophy shopping bag. The Case with zip, made from embossed paper Ecophilosophy, is entirely stitched using cotton thread along the outer edges; the color of the stitching and the zip can be matched to that of the bag. The 100% pure cellulose paper has FSC-CW certification as it comes from sustainable farming; it is water-resistant and fully recyclable. 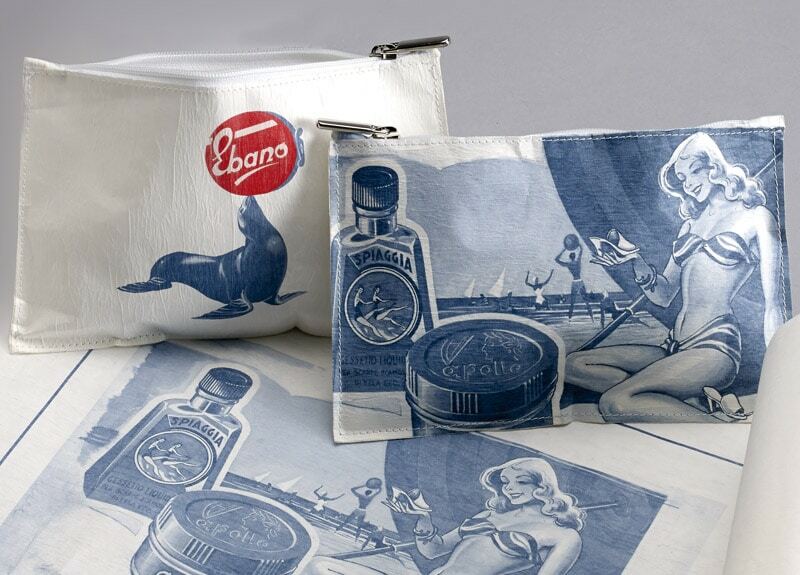 Your design can be printed over the entire surface of the WRAP bag with zip using vegetable-based inks. NO GLUE is used in the creation of this product. Detail with different kinds of colors and shapes. Examples of customizations with vegetable-based inks printing without the use of any type of glue. 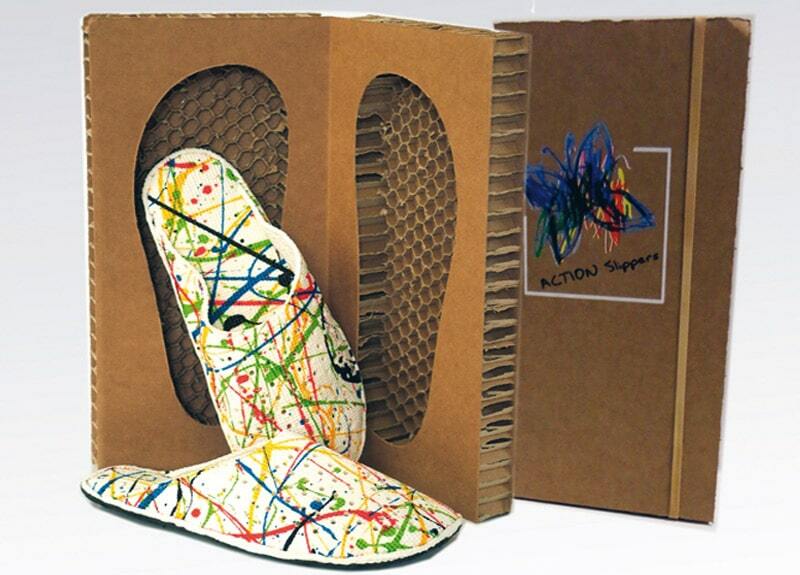 In the ​​packaging industry, cardboard is increasingly in demand because it is easily disposed of. 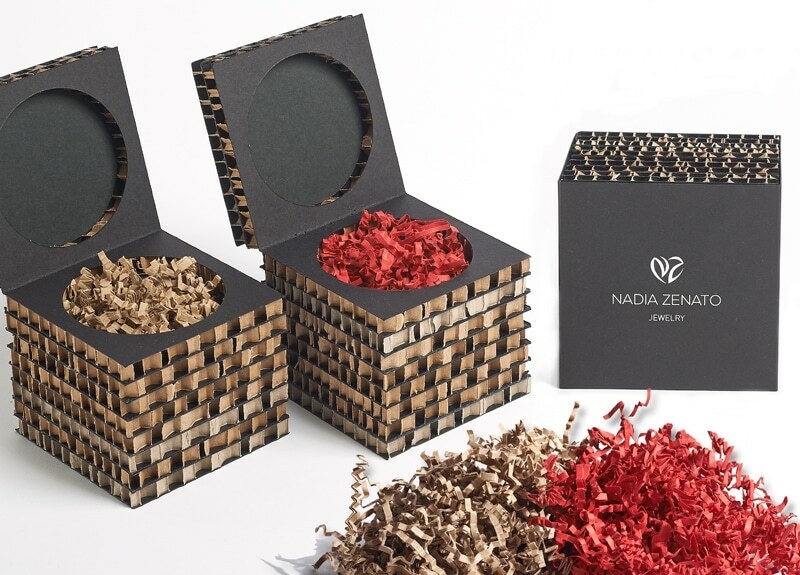 It is environmentally friendly, versatile, lightweight but strong and can be used to package items in original ways. Images and texts make it a great communication tool. 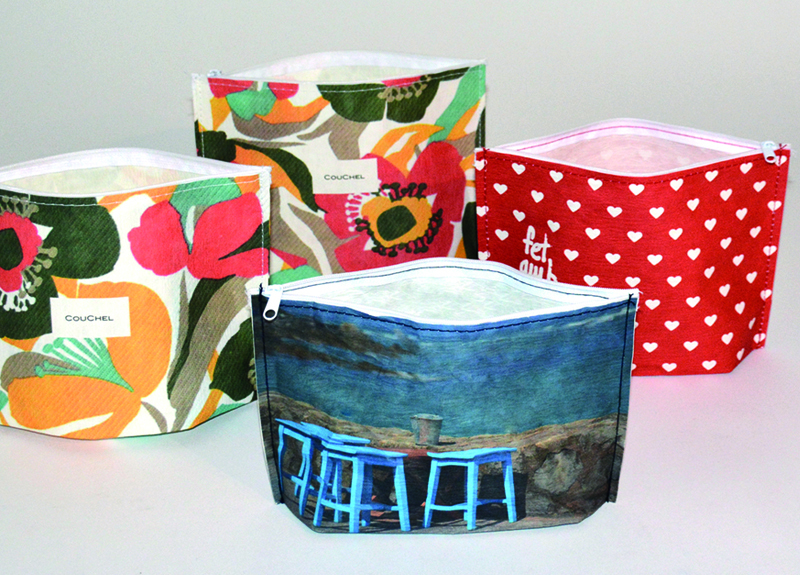 It can be used to hold and carry items and to exhibit the product in stores. Detail of the chipboard paper. 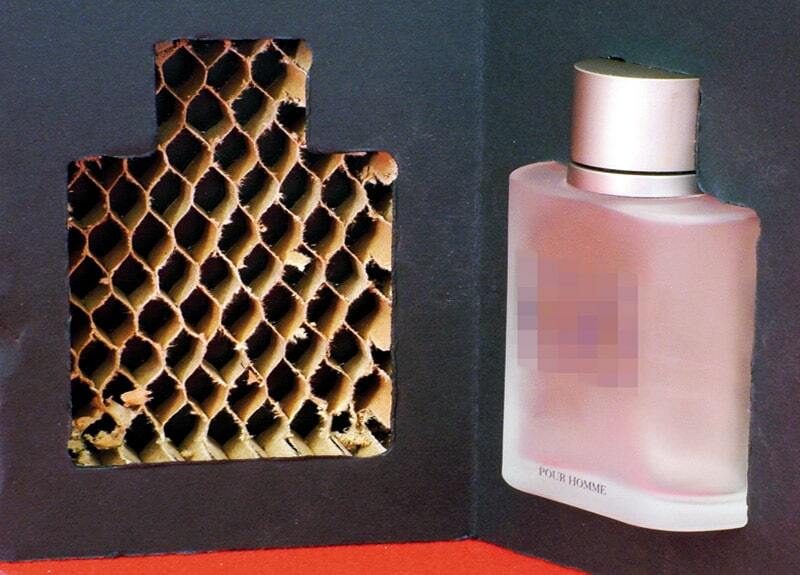 Honeycomb Packaging becomes a simple and innovative exhibitor. Honeycomb Packaging suitable for shipping. 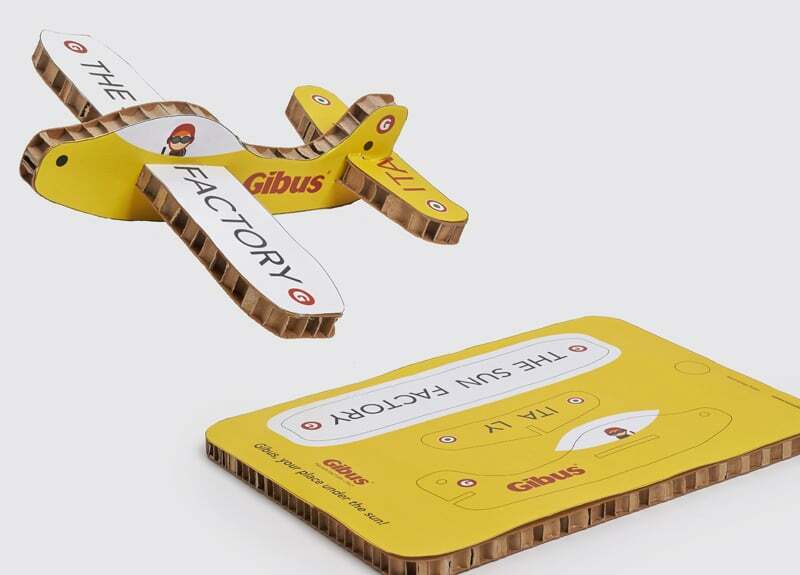 For the Salone Internazionale del Mobile 2015, Alisea created the ‘Gibus yellow airplane’ made of the interlocking parts of recycled cardboard. Rackets with ball available in different colors, with possibility of customization.